In 1955, St. Joseph's Parish in Mandan had grown to some 6,500 members, an unheard-of size for this region and an unworkable number of effective pastoral ministries. The pastor, Monsignor Aloysius Galowitsch, began to plan for a new parish and would eventually repeat his prior success by establishing Mandan�s second Catholic Parish at Christ the King. <?xml:namespace prefix = o ns = "urn:schemas-microsoft-com:office:office" />Aloysius Galowitsch was born July 21, 1901 at Neumarkt, Austria which is a small town near Vienna. His father Aloysius died in 1912. That fall, his mother Frances (Zartler) Galowitsch took her son and daughters Helen (Ganzer) and Frances (Bernini) and immigrated to Chicago. Aloysius attended St. Philomena Grade School from 1913 to 1916. He continued his education at College Josephinum, Co­lumbus, Ohio where he received his secondary education and theo­logical training. A chronic illness kept him out of school for nearly four years. He was ordained to the priesthood May 29, 1930, in Columbus, Ohio. For health reasons, he was assigned �out west.� On July 4 of that year he came to the Church of St. Joseph in Dickinson as assistant to Msgr. G. Aberle. In April 1936 he was appointed pastor of Our Lady of Consolation at Alexander (McKenzie County, ND). He took care of that parish as well as six mission churches, sometimes putting on over 30,000 miles on his car in the depths of The Great Depression. He was named to the ND Health Planning Commission as well as heading the State's Hill-Burton Committee (which coordinated Federal spending for rural health care) from 1947-1969. He would eventually serve as Director of Hospitals for the Catholic Diocese of Bismarck and oversaw planning and operations for Catholic hospitals in Western North Dakota. In 1944 he was appointed pastor of St. Vincent's parish, Crown Butte. In 1947 Bishop Ryan appointed him pastor of St. Mary's Church in New England. In addition to serving as the priest for this parish, he was primary fundraiser and supervised the construction of their grade and large high school. With the population boom due to the construction and operation of Standard Oil Company's petroleum refinery and the adjacent MDU Heskett Power Plant, the congregation at St. Joseph's grew beyond its physical facilities. It was time for a second Catholic parish in Mandan. A kickoff meeting was held on August 8, 1957, at which Msgr. Galowitsch asked for a day's wage per month for 30 months. Land was acquired from Dr. William Neff and Clem Albers in northwest Mandan. The architect chosen was Bernard Hillyer of Bismarck, a man who designed so many of the churches in the Diocese. Msgr. Galowitsch had overseen an extensive building program at New England, and he repeated his success in Mandan. Christ the King was a big parish from the start, with about 500 families. Work progressed quickly on the school. Six rooms were ready for classes in the fall of 1958. A multipurpose room was used for parish liturgy until the church was completed. The dedication of Christ the King Church took place on April 28, 1959 with both Bishop Lambert Hoch and Bishop Hilary Hacker in attendance. Fr. Galowitsch was assigned as the church's first pastor. He remained there until his retirement on July 1, 1970. He came out of retirement in 1976 and served as pastor of St. Mary's Church, South Heart until April 1, 1981, when he re-entered retirement. 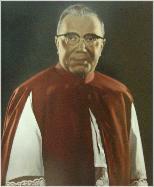 Aloysius Galowitsch was elevated by Pope Pius XII to the rank of Domestic Prelate with the title of Right Reverend Monsignor, according to Bishop Lambert A. Hoch of the Bismarck Diocese. This honor was in recognition of his outstanding service given to the church. Msgr. Galowitsch died December 24, 1992 at St. Vincent's Nursing Home in Bismarck at the age of 91. 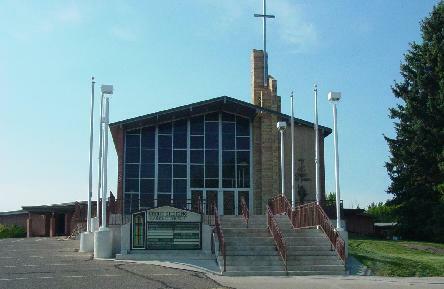 Funeral services were held at Christ the King Church, Mandan, officiated by Bishop John F. Kinney. He is buried in Mandan Union Cemetery.